There’s nothing quite like a powerful opening line to a book and Steelheart has one of the best. 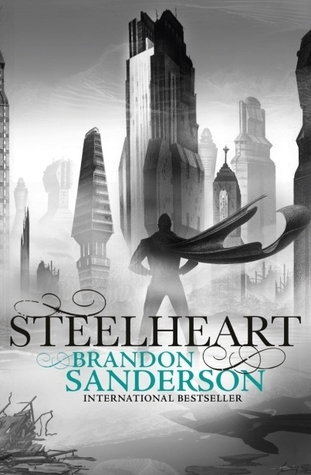 Steelheart was a mash-up of comic book superheroes and a crime novel but in true Sanderson style he nailed it. Despite being a huge Sanderson fan I was a bit wary of Steelheart as I knew it is considered a Young Adult book and I’ve never read any of his YA stuff before, but I was pleasantly surprised by this book. It follows David Charleston who in the beginning of the book is 8 years old and witnesses his father get murdered by an Epic. An Epic is a human who developed superpowers when Calamity came, and as they say absolute power corrupts absolutely and Steelheart is a perfect example of that. He appears out of nowhere to save the humans stuck in a bank being terrorized by DeathPoint (believe me, the names these superheroes choose for themselves are less than desirable) but then changes his mind and lords his presence over them claiming they are his. David’s father stands up to Steelheart, attempts to shoot DeathPoint with a gun but accidentally grazes Steelheart and ends up dying for his cause. The first few chapters of this book are in the past and they are brutal, it’s not a pleasant thing to see your father murdered in cold blood before you but David survived by some sheer miracle – Steelheart destroyed everything in the bank and all the rescue workers and patrons of the bank after they witnessed him getting shot, after this Steelheart turns the entire city into steel and the city is renamed Newcago. Once David joins The Reckoners as a tag-along he has to prove to them he knows what he is doing, this includes gathering his many notebooks of research he has compiled on the Epics, Megan, a Reckoner, shows a lot of hostility towards David and there’s not really a reason why which is quite annoying until right at the end of the book (no spoilers sorry) when it is finally revealed. It’s quite cute actually – unrequited love for a teenage boy with the woman of his dreams only for her to die. Or did she? There are some wicked revelations in this book and even better cliff-hangers and I hate cliff-hangers but these were awesome. The writing style – although it was a Young Adult novel – was very similar to Brandon’s other works and I was glad he hadn’t deviated massively from his usual style. He kept the perfect balance between dialogue and prose and didn’t make any massive jumps in time without explanation. My favourite line in this whole book is: “What do you trust when your own thoughts and emotions seem to hate you?” and it makes me think about it, what can you trust? It’s a very good coming of age book with a neat sci-fi flare to it.